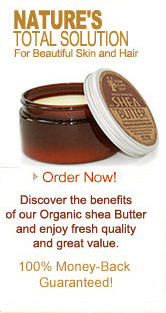 Whether it's your first time trying Shea Butter or you're familiar with it, we guarantee you'll love the quality and effectiveness of our Organic Shea Butter. We invite you to try our products risk-free by offering a 30-day money-back guarantee on all orders! If for any reason you're not happy with our products, simply contact us within 30 days from the date you received it and we'll give you a full refund. Please call Customer Service: 281.702.0864. 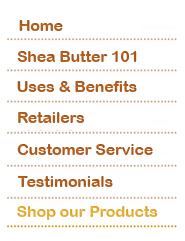 Monday to Saturday 8:00am-6:00pm, CT.
Or Send us an email 24/7 at: customerservice@theorganicsheabutter.com.